Well, been a long time since I have had a bit of spare time to write anything here. This isjust a quick one to put a couple of photographs of what I have been working on. 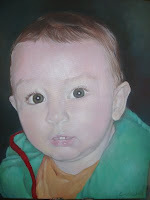 Painting again, I have had two commissioned portraits to do. The one of the little boy is now finished, and it is acrylic on canvas, 30x40. 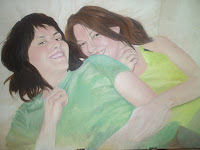 The other one of the two girls, I am still working on, it's oil, and is taking longer because of drying times. 50x70cm. The weather here has got really, really hot, and I don't feel like doing anything at all, but work must go on. I haven't even been swimming yet! !